What do you get if you cross an E-Type Jaguar with an old fashioned Mini and then add some Italian spice to it? Answer, you get an Abarth 1000 Bialbero. When I first saw an Abarth at the Earls Court Motor Show in London I wanted one – at the time I was about ten years old and didn’t yet have my own check book yet – but I wanted one really badly. 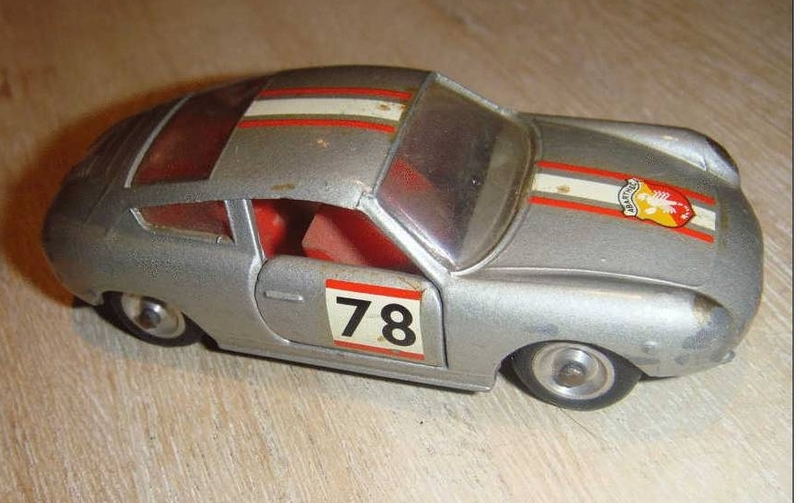 I didn’t get a twelve inches to the foot scale model of the Abarth, but my dear long suffering Dad got me a 1:43 model of the Abarth 1000 Bialbero so I could dream. It remained a dream, even to this day. The car is still on my top ten list of cars to at least drive and preferably own, but I suspect I’m not likely to get my sweaty palms around the steering wheel of one, at least not in this life. 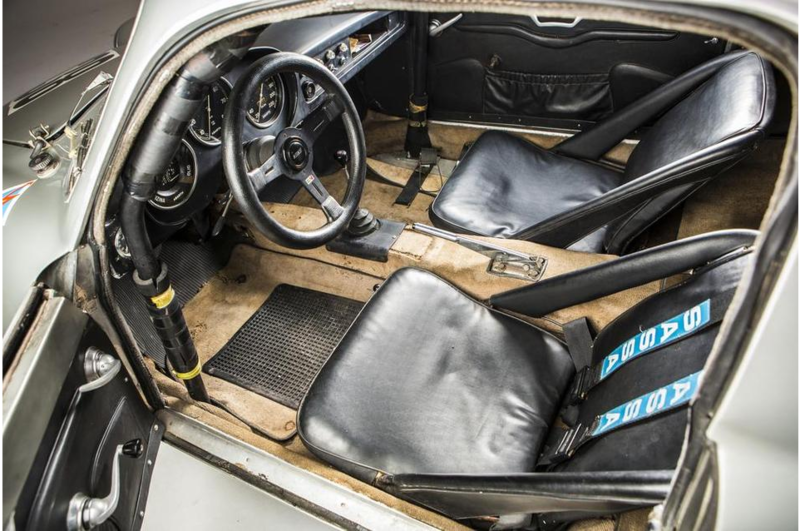 The cockpit of the 1961 Fiat Abarth 1000 Bialbero. This really is a “Boys Own” racer. 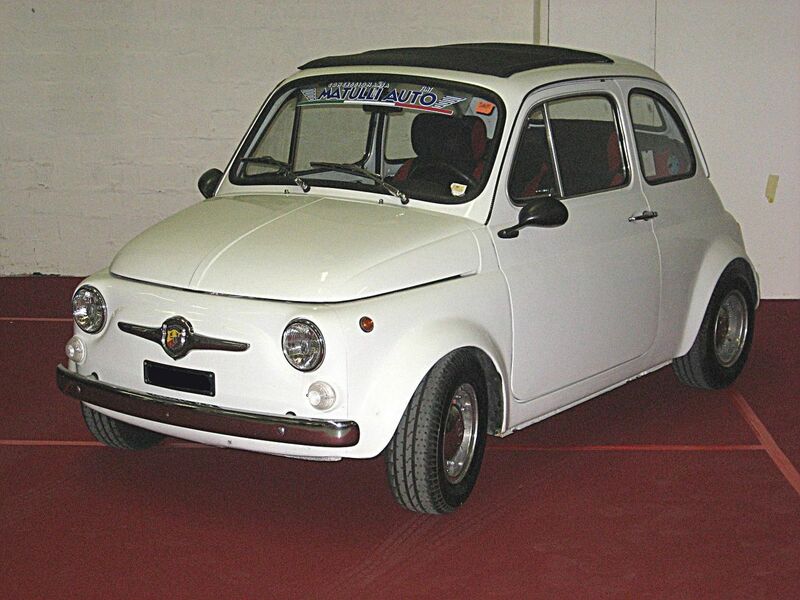 Carlo Abarth believed in small lightweight cars with a small frontal area powered by highly efficient small engines. Once he had established a car company of his own and moved that company to Turin in Italy he began his long association with Fiat and the small Fiat cars the 500cc “Bambina” and the only marginally larger 600cc. When I first started admiring them at the London Earl’s Court Motor show I was just a boy and these were “boy size” sports cars capable of over 100mph. Being allowed to sit in one and try the gears was guaranteed to get a boy saying “Dad, can we buy one of these … today?” These were the small sports car that preceded the BMC Mini, and they were and are wonderful machines. Abarth 695 of the early sixties. The Fiat Abarth 1000 Bialbero was a development of the 750 Record Monza and 700 Bialbero models. The “1000” engine of actual capacity of 982cc was derived from the Fiat 600 engine. 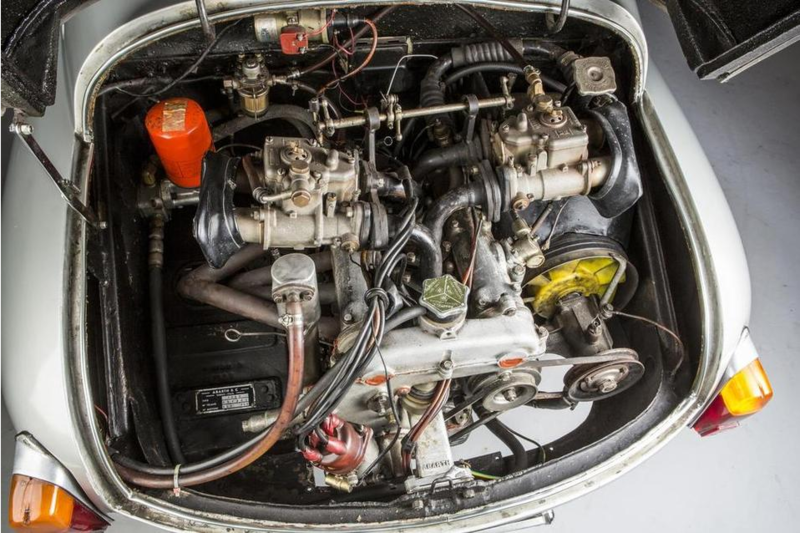 The Fiat engine was bored out and then fitted with a double overhead cam cylinder head with hemispherical combustion chambers and, of course, with a somewhat increased compression ratio. With 2 Twin Choke, Weber 36DCL Carburettors hanging off the top of it the end result was 91bhp at 7000rpm, i.e. almost 100bhp per liter and a little sports car that would chirpily do over 120mph. The Fiat “Bambina” 600 cc engine re-worked by Abarth to bring capacity up to 982cc along with twin overhead cams and twin dual throat Webber carburettors churning out almost 100bhp per liter. The end result was a car that sounded delightful and performed just as delightfully as it sounded. You’ll find a nice little view from the cockpit video here of a happy driver taking one for a not too strenuous “leg stretch”. These Fiat Abarth Bialbero cars are small and light. the wheelbase is just 2 meters and the overall length less than 3.5meters. Curb weight is 570kg. With an all independent suspension front and rear you get lively handling and racehorse speed. In short you get something that is an absolute blast to drive. 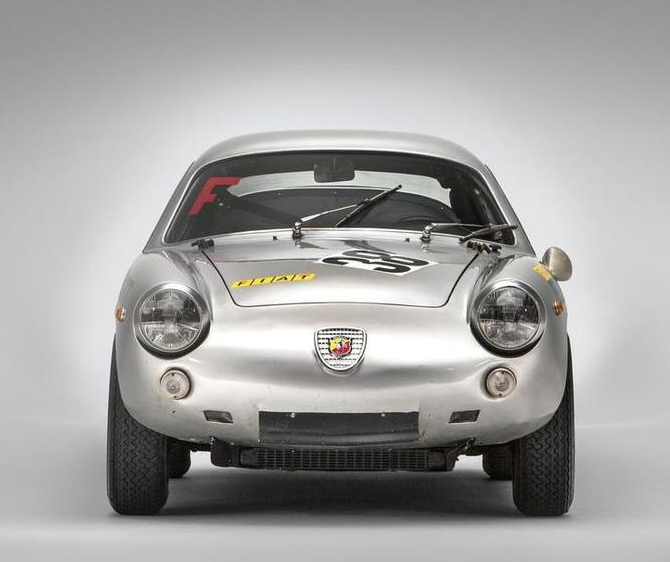 That these Abarth Bialbero were a blast to drive is evidenced by their record in competition where they were busily obtaining class wins in almost every event they were entered into in the early sixties. It was during the early sixties that the cars were being progressively improved both in subtle changes made to improve the body shape and in replacing the front drum brakes with discs to make sure they were little cars that could stop as well as go. The particular car we have featured in this article is coming up for sale at the 2015 Goodwood 73rd Members’ Meeting. . You’ll find more specific details about this car here. These were of course not the only cars Abarth became famous for. One of the most beautiful examples of sports car design ever was the 1969 Fiat Abarth 2000 Scorpione. 1969 Fiat Abarth 2000 Scorpione concept car. (picture courtesy grrc.goodwood.com). One of the most beautiful examples of car design ever. The 1969 Fiat Abarth 2000 Scorpione was designed by Filippo Sappino of Pinninfarina and was built on an Abarth racing chassis. With its racing engine and clutch it is apparently a challenging little machine to drive but well worth the effort. For those interested in a 50th Anniversary of the 695 Abarth there’s a review by the Top Gear team here. For the rest of us mere mortals with modest mere mortal bank accounts we can still own something with the Abarth scorpion on it; such as this T-shirt, watch, or key fob. And for the academics and those into vicarious experiences you can also get the book, and/or the road tests. 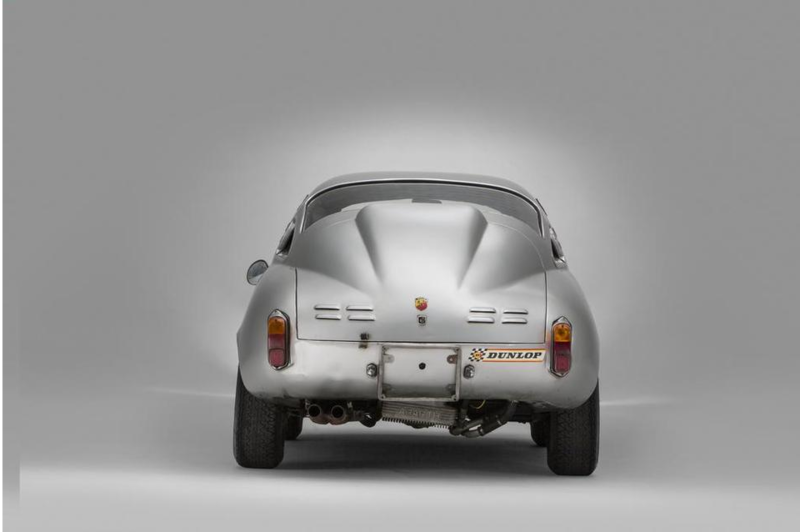 Then you’ll be able to say “Oh yes, Abarth; I’ve read the book, bought the T-shirt, wearing the watch…” etc. The view that most people get of a Fiat Abarth 1000 Bialbero.